The first ever Dunlop Masters Superbike Championship official test weekend takes place on Saturday March 23rd and Sunday March 24th. The event will have a number of purposes in addition to providing track time for competitors. 1. The test weekend will be designed to assist riders in Supersport and Superbike who are new to using Dunlop Tyres to become acquainted with the tyres through technical help and a reduced price offer on purchase of tyres for use at the test weekend. 2. To assist inexperienced riders and those looking to improve their performance through technical support on suspension set-up. 3. To help riders get the most from their machines and themselves through coaching by experience racers. 4. To provide increased early season mileage in a non-competitive environment for less than the cost of a race weekend. 5. The test weekend will be used for media activities surrounding the championship including photography for use on the Masters web site and may include filming of pre season promotional videos. The weekend is open to all Motorcycle competitors whether they are racing in the Masters or not. All classes will be accommodated and riders can book in for the two days or for a single day. To encourage riders to swap to Dunlop tyres and to assist Masters Superbike and Supersport competitors to adapt their bikes to the championships control tyres, Dunlop are offering a €50.00 off voucher to all competitors buying tyres at the test weekend. At sign on riders will be given a voucher with their race number and name on it. Once a voucher is redeemed, riders who have purchased tyres may have their tyres checked when leaving the pits to ensure the tyres purchased were for their own use. – There will be five groups of riders each day and each group will have four twenty minute sessions over the course of the day. – All sessions will be officially timed with printouts available for all riders. – Groups will be split by class and by rider ability to make the day more effective and safer for riders. Groups will be created based on the info provided by riders when booking in but may be altered during the day to even out the performance levels across the groups if required. – All riders will be told which group they are in at sign on and will be given a timetable for their sessions. – Due to the number of solo riders wishing to take part, Sidecars and Junior Cup will now only run on a single day each, Sidecars will be on track on Saturday only and Juniors on track on Sunday only. – We will have two rider coaches on hand for the weekend with Jack Kennedy and Caolan Irwin available to all riders. – For a number of reasons we have been unable to get hold of a suspension coach as hoped. – Technical support will be available from Dunlop for both days. – All riders wishing to use Dunlop tyres will be given a voucher for €50 off a set of tyres when they sign on. – There will be a short forum on Saturday evening where we hope to have technical talks on set up, riding tips and tyres.The forum will also include an open session for riders to offer input into the 2019 championship. The Masters Superbike Championship test weekend is now fully booked. If you are a competitor and would like a space on the reserve list please contact Jackie O’Neill at Mondello Park on 045860200 (ROI) +35345860200 (elsewhere). Group 1 – Twins, Pre-Injection, Moto 400 and Classic Superbikes. Group 2 – Superbike Pro, Supersport Pro and faster Superbike Cup and Supersport Cup riders. Group 4 – Superbike Cup and Supersport Cup riders. Group 5 – Remaining Twins, Pre-Injection, Moto 400, Superbike Cup and Supersport Cup riders. Group 1 – Twins – Pre-Injection- Moto 400. Group 3 – Junior Cup and Junior Supersport. The Masters Motorcycle Show will once again be part of the opening race event of the Masters season with show admission included free of charge in the reduced admission price, see below for details. We will be posting information on the event here in the run up to the season opener. TICKETS: Click HERE to purchase tickets for April 6th & 7th. RACE TIMETABLE: Updated April 4th, for printable version CLICK HERE. The 2018 Dunlop Masters Superbike Championship season opener, at Mondello Park on April 6th & 7th, will include the MastersMotorcycle Show. 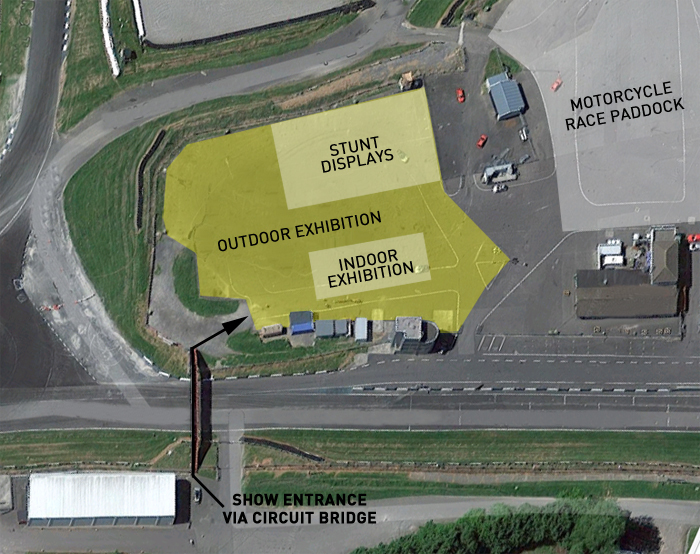 For the Su7nday of Rounds 1, 2 & 3 a large part of the Mondello Park paddock will be taken over by our Motorcycle Show, which will include both indoor and outdoor exhibits. 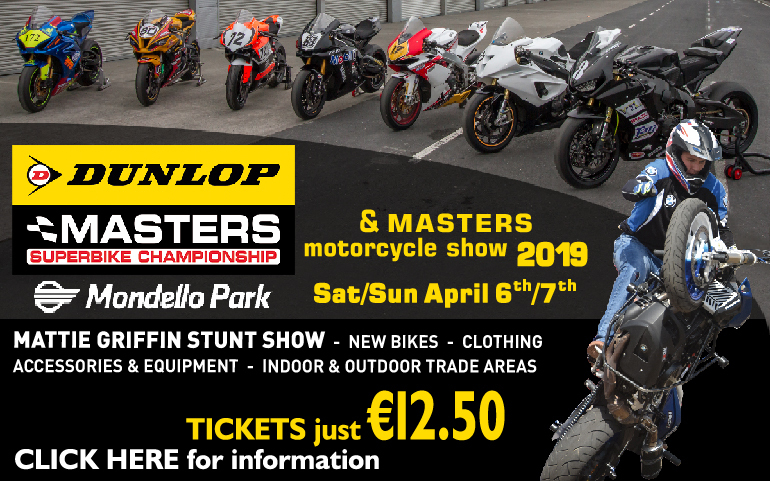 Access to the show area will be included in the Masters admission price which is will be available for just €12.50 making this event the most attractive ever Mondello Park event for fans of the Masters and motorcycling in general. Alongside rounds two and three of the Masters Superbike Championship additional motorcycle entertainment will be provided by the spectacular Mattie Griffin who will perform three times over the day in a dedicated area within the Mondello Park paddock. The paddock will also house displays of motorcycles from Yamaha, Triump, Ducati, motorcycle shops, Masters Superbike Championship partner Principal Insurance along with a wide variety of Motorcycle related traders and service providers. DATE: Saturday & Sunday May 11th & 12th. CLASSES RACING: Superbike, Supersport, Pre-Injection, Supertwins & Production Twins, Junior Cup & Junior Supersport, Sidecars (2 races Saturday, 1 Sunday), Moto 400 & Classic Superbikes (Saturday only). TICKETS: Click HERE to purchase tickets for May 11th & 12th. DATE: Saturday & Sunday June 22nd & 23rd. CLASSES RACING: Superbike, Supersport, Pre-Injection, Supertwins & Production Twins, Sidecars, Junior Cup & Junior Supersport (2 races Saturday, 1 Sunday), Classics (Saturday only). TICKETS: Click HERE to purchase tickets for June 22nd & 23rd. DATE: Saturday & Sunday July 27th & 28th. CLASSES RACING: Superbike, Supersport, Pre-Injection, Supertwins & Production Twins, Moto 400 & Classic Superbikes, Sidecars (2 races Saturday, 1 Sunday), Junior Cup & Junior Supersport (Saturday only). TICKETS: Click HERE to purchase tickets for July 27th & 28th. DATE: Saturday & Sunday August 24th & 25th. CLASSES RACING: Superbike, Supersport, Pre-Injection, Supertwins & Production Twins, Sidecars, Junior Cup & Junior Supersport (2 races Saturday, 1 Sunday), Moto 400 & Classic Superbikes (Saturday only). TICKETS: Click HERE to purchase tickets for August 24th & 25th. DATE: Saturday & Sunday September 28th & 29th. TICKETS: Click HERE to purchase tickets for September 28th & 29th.